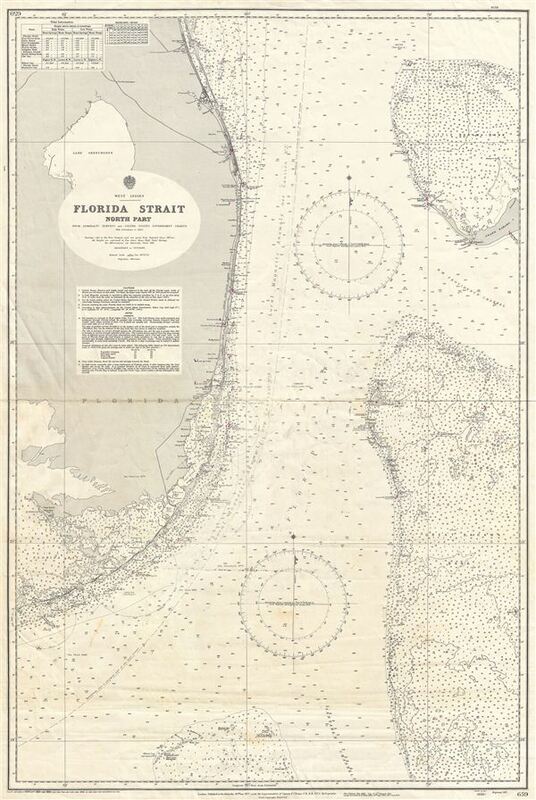 An uncommon 1954 British Admiralty nautical chart or maritime map of South Florida, the Florida Keys, and the Great Bahama Bank, known collectively as the 'Florida Strait.' The map covers Florida from St. Lucie (Fort Capron) south to the Cay Sal Bank, including the Florida Keys west as far as Bahia Honda, and the Bahama Bank from Grand Bahama and the Little Bahama Bank to the Santaren Channel. The chart offers a wealth of practical information for the mariner and countless depth soundings in fathoms. Biscayne Bay and Miami are noted. The Admiralty originally released this chart in 1877, the present example represented updates through 1954. Represented Admiralty chart no 659. Good. Some creasing along original centerfold. A working nautical chart, this map exhibits some erased pencil marking associated with navigational use.